Microsoft appears to be continuing its strategy of developing midrange phones for the American and overseas markets, if data collected by a Windows Phone cross-promotion network is any indication. 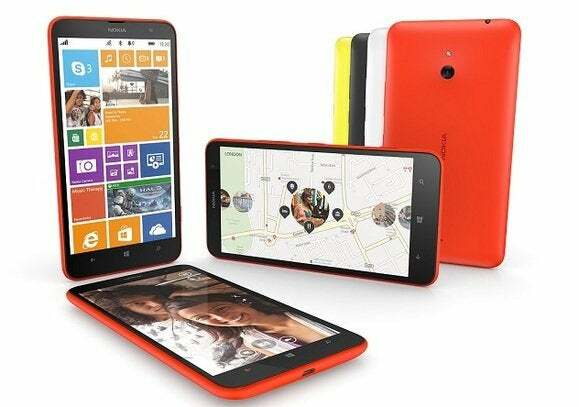 According to a survey of 5,005 Windows Phone apps running on the AdDuplex network in late November, the Lumia 735 "selfie phone" has begun appearing on Sprint's network, as predicted by the FCC's own compatibility report in late September and by publications like PhoneArena. The data also reveals the presence of a new, unannounced phone: the Lumia RM-1062, which AdDuplex expects to be a replacement for the Lumia 1320, the overlooked little brother of the massive Lumia 1520 phablet. Microsoft declined to comment on the AdDuplex findings. Why this matters: So far, Microsoft's made it fairly clear that it's abandoning the premium flagship smartphone race for something a bit more understated and affordable. I was surprised how much I liked the Lumia 830, what Microsoft calls an "affordable flagship." It now seems that Microsoft might pursue the same strategy with a second-generation "affordable phablet." 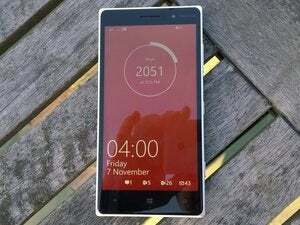 An apparent drawback to the Lumia RM-1062, as reported by AdDuplex, is that it will have a 720p screen. That's a loss in the specs column, although it'll have positive implications for battery life. Microsoft might make the argument that you can't really tell the difference between 720p and 1080p video on a smartphone, even if it's a larger-screen phablet. The RM-1062 also self-reports as the RM-1063, RM-1064, and RM-1065, AdDuplex noted. That essentially means it'll have derivatives for various markets: AdDuplex reports it's seen the phone in Finland, some Asian countries, and on AT&T's network within the United States. 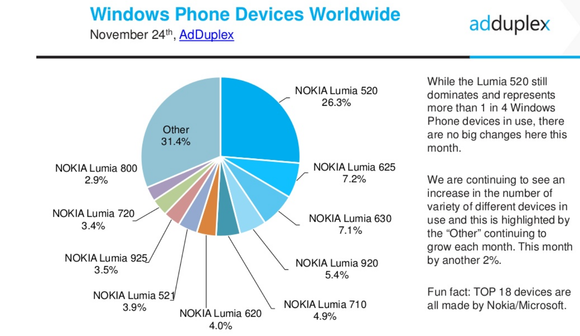 Microsoft's value phones are still the top sellers, according to AdDuplex. Specifically, AdDuplex found that the RM-1062 will have a 720p screen spread across a 5.7-inch display, a tad smaller than the six-inch screen used by the Lumia 1520 and 1320. While the Lumia 1520 was sold in the United States, the 1320 was shipped to markets like Vietnam as a lower-cost option. It now appears that Microsoft will be widening its net. AdDuplex also reported seeing the low-end RM-1069 phone (with 4-inch, 480x800-pixel display) in Asia, as well as the 5-inch RM-1072 phone in Finland. Value phones continue to be the most popular phones AdDuplex has seen on its network, and the Lumia 520 continues to dominate all other Windows Phone sales. But there's another bit of good news for those who detest fragmentation: Within the United States, over half of all available smartphones now run Windows Phone 8.1, the service said.